Inside the observatory recital hall a piano struts before an audience of empty clear chairs. The floor is as transparent as the walls, which means I witness the golden sunset and the Han River rushing directly beneath my feet at the same time. Back outside it is just Barret, a metrosexual figure in a sheet metal suit, and I who enjoy the cool breeze sprinting through the railing of the Gwangjingyo observatory (which is one of only three under-bridge observatories in the world). Just before sunset a parade of school marching bands performed in an outdoor amphitheater. 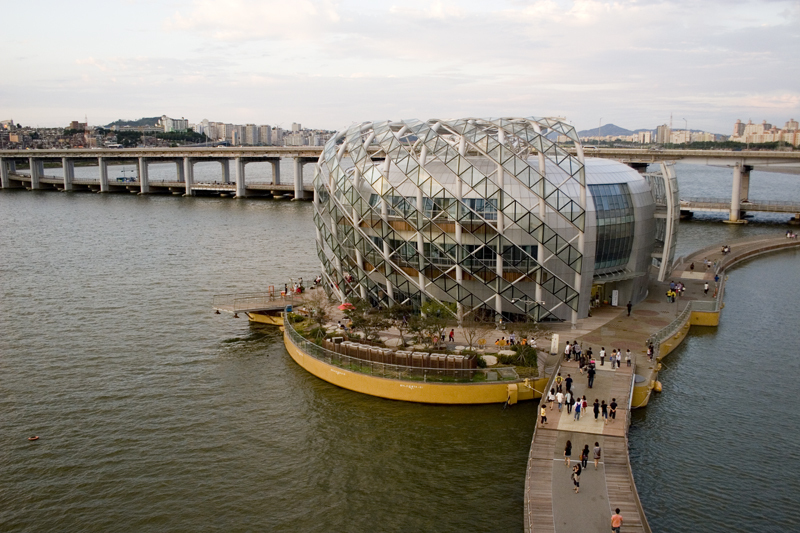 Behind the musicians shell-shaped buildings rose from artificial islands in the Han River. When the sun set, their LED infused walls erupted into a mercurial swamp of neon. Outside a makeshift convenience store on the first island, Barret and I waited for the longest bridge fountain display in the world. As the clock drew near 8 pm, camera bags unzipped and tripods unfolded. 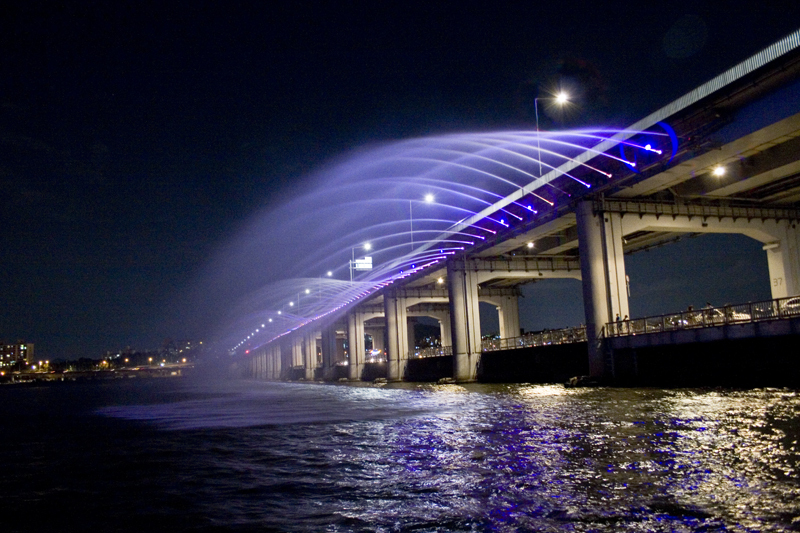 Suddenly synchronized jets spurt from the second tier of the bridge. While the limited range of the rainbow-hued stream felt robotic, the vista and architecture were both beautiful and unexpected. Gwangjinyo– Cheonho Station Line 5, exit #2. Banpodaegyo– Express Bus Terminal Station, Lines 3, 7, or 9. No, that is a cut out of a character from the TV show Iris. They filmed some scenes there so there is promotional material on the patio and in one of the rooms.